Since 2008, the growth of 13 pin systems has escalated and has now become a more or less standard option for most caravan owners. 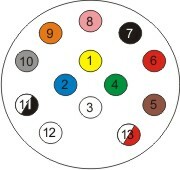 Issues such as pin burnout and bad pin contact which affected the 12S socket system has been virtually eradicated by the change over to 13 pin. The 13 pin system in generally accepted use, is that as described in ISO 11446. This design is the most widespread throughout Europe. With the change to 13 pin now firmly in place, there will always be the need for ‘adapter sets’ to interface the different connections between the car and caravan. Right Connections has a wide and varied range of adapters so please visit this page on our website. 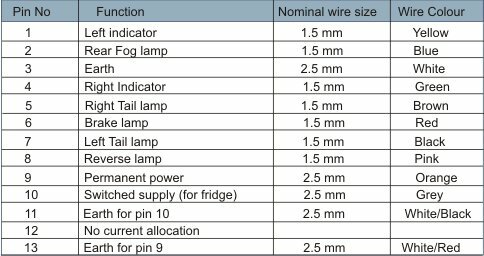 We have provided a guide to pin functions and wire colours which you may find useful.